Nordstrom announced it will no longer carry Ivanka Trump merchandise, citing a 66 percent drop in sales of her products over the prior year. These events highlight the increasingly important role consumer activism can play in social change. Boycotts and buycotts by environmental activists to pressure corporations and industries to change their policies and practices also have a long history. We recently published a new scientific article: The consumer as climate activist. We found that Americans are more likely to engage in consumer activism than political activism to combat global warming, and it’s on the rise. Yet most Americans don’t realize that consumer activism can influence companies. And even those that do seek to influence companies are more likely to express their concerns via their individual purchasing decisions, rather than by speaking out publicly about the corporate practices they oppose. Other studies have found, however, that bad publicity often has a greater impact on corporate behavior than decreased sales. Together, these results suggest that climate change consumer activists can be most effective by publicly communicating their concerns about corporate behavior as part of boycott or buycott campaigns. 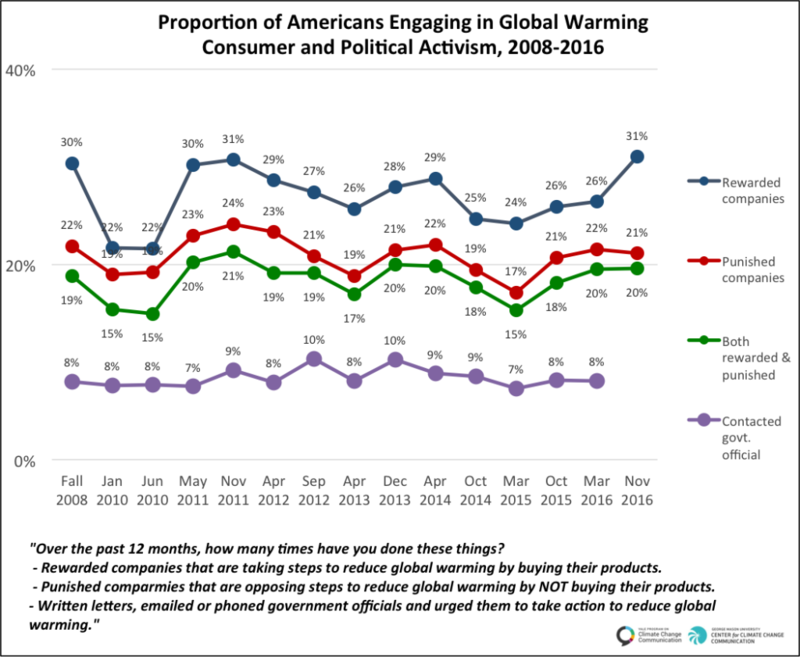 Consumer activism on global warming is relatively common in the U.S., and has increased in the past two years. In November 2016, close to a third of Americans said they had rewarded companies that are taking steps to reduce global warming by buying their products more than once in the prior year (31%). 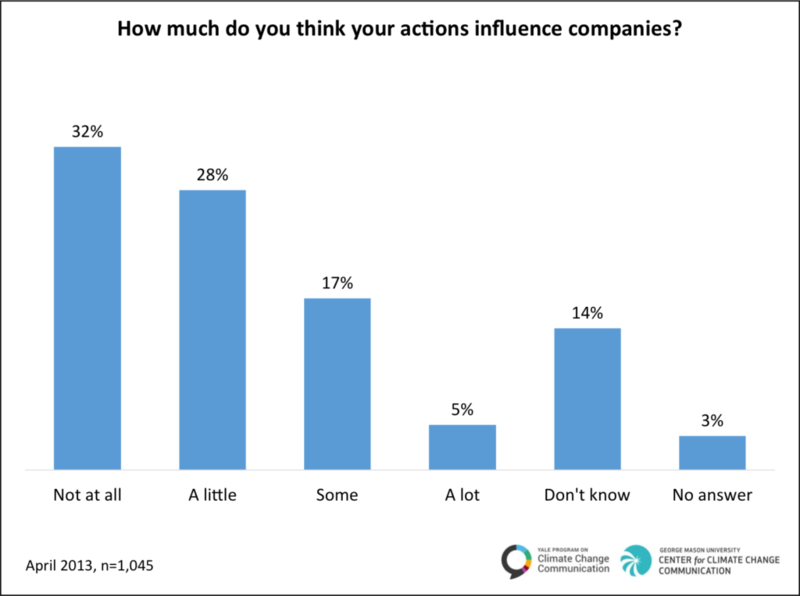 One-in-five said they’d punished companies for opposing climate action by avoiding their products (21%). Twenty percent had taken both actions, both rewarding and punishing companies through their purchasing decisions. By contrast, one in ten or fewer Americans contacted an elected official to urge action to reduce global warming during these years. 2. Consumer activism can be effective. Studies of consumer movements show they are often successful in changing corporate practices: Boycotts that receive at least some national media attention have about a one-in-four success rate in influencing corporate practices (Friedman, 1985; King, 2008); and for those that include public protests or demonstrations, the success rate jumps to about half (Friedman, 1985). Most Americans do not realize how effective consumer activism can be or how it influences companies. Consumer activism has a greater impact on corporations than most Americans recognize. In a nationally representative survey in March, 2013, 60 percent of respondents said their actions affected companies “not at all” or “only a little,” and only 5 percent believed their actions could influence companies “a lot” (Roser-Renouf et al., 2016). Most consumers believe that their leverage comes from their impact on a company’s sales. What usually motivates companies to change their practices, however, is bad PR – negative press attention, unhappy customers, and corporate concern about their reputation. Most boycotts succeed by creating public image crises for corporations – not by reducing sales (King, 2008). This suggests that spreading information about objectionable corporate practices is a more powerful method of influencing companies than simply purchasing more climate-friendly products. The paper includes many other important findings, including the influence that key climate change beliefs, social norms, and the perceived efficacy of consumer action have on consumer behavior, including both purchasing decisions and consumer activism. Friedman, M. (1985). Consumer boycotts in the United States, 1970–1980: Contemporary events in historical perspective. Journal of consumer affairs, 19(1), 96-117. King, B. G. (2008). A political mediation model of corporate response to social movement activism. Administrative Science Quarterly, 53(3), 395-421. Roser-Renouf, C., Atkinson, L., Maibach, E., & Leiserowitz, A. (2016). The Consumer as Climate Activist. International Journal of Communication, 10, 24. Roser-Renouf, Atkinson, Maibach and Leiserowitz, "The Consumer as Climate Activist," International Journal of Communication, 10(2016), 4759–4783 1932–8036/20160005. Photo:© Alancrosthwaite | Dreamstime.com - GMO Protest In San Diego, California.